New Zealand boasts some impressive wooden structures – Wellington’s Old Government Buildings has for over 140 years ranked as one of the world’s largest wooden buildings – and the country is about to receive another giant, courtesy of Air New Zealand. 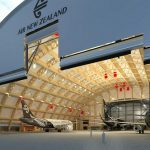 The airline will later this year start constructing the largest single-span timber-arch aircraft hangar in the world at its engineering base in Auckland. The 10,000-square-metre hangar will be located on the airline’s Auckland engineering base at Geoffrey Roberts Road in Mangere. The structure will sit adjacent to the existing Hangar 3, while new workshops and tools stores will connect the two hangars, providing increased maintenance programme efficiencies. Render of Air New Zealand’s new Hangar 4 to be constructed at the airline’s Auckland engineering base. The new timber hangar will be a 5-6 Green Star development certified by the New Zealand Green Building Council, meaning it will meet the highest standards of sustainable building construction and operation. A double-layer insulated fabric roof will enable the hangar to retain heat without the need for a heating system, while several large ceiling fans will circulate warm air back down to floor level in winter and provide a cooling effect in summer. 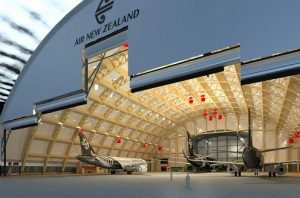 Air New Zealand chief ground operations officer Carrie Hurihanganui says the existing hangars, built in the 1960s and 1980s, have served the airline well, but “our fleet has grown both in number and in physical size over the past decades. We now have a need for a more modern, innovative structure that takes energy use and other sustainability factors into account. Another grand New Zealand wooden building. 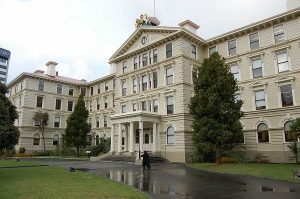 Old Government Buildings, Wellington, one of the world’s biggest wooden buildings since 1876.